Lightload Towels are handy, convenient towels that you can use for most any job. These 12 x 12 sized hand towels can really help make life easier for you. I reviewed a 3 pack set of these towels from Lightload and Tomoson. These towels come compacted into a small round disc that you run under the water and watch them grow into a hand towel. Lightload Towels can wipe up anything and everything! You can also use these towels for fire starters, a mask, a diaper, a windscarf or to wipe off sweat when working out. The uses for this towel are endless. After you use the towels, just wash them out and let dry. Lightload Towels can be used again and again. Lightload Towels come in a 3 pack for $6.95 What a great low price for such a versatile towel. Take these towels camping, to the gym, fishing, golfing and just about anywhere you need a little clean up job. I recommend these towels to everyone, they work great and are something you really need to have on hand. 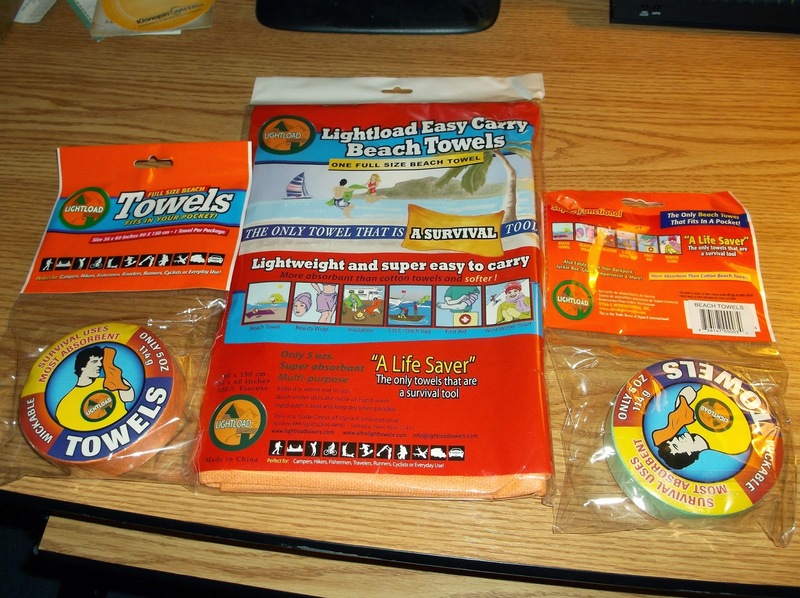 Lightload Towels is giving one of my lucky readers a 3 piece set of their towels. Just enter my Rafflecopter and Good Luck! When you have ever gone to the beach have you thought there has to be a better way to carry a towel well with Lightload Towels there is as this is a towel so small it fits in your back pocket or lightweight and very easy to carry. I got a few to review and one is an Ultra Space Saver Towel which is 36×60″90x150cm and fold so neat. These towels can be used again or thrown away after use. It is also more absorbent than cotton beach towels, dries much quicker than cotton and almost weightless when wet, easier to handle than cotton when wet, disposable/reusable don’t need to carry back after a trip, softer than cotton. I also got 2 Lightload Beach Towels the Only Beach Towels That Fit in Your Pocket weights only 5oz., more absorbent than cotton and microfiber, wick able fabric so insulates against heat and cold. My Opinion: These are great for camping and taken to the beach, the colors could be more attractive than just brightly colored but they do work well and can be taken anywhere even flying as they do not take up much room.They can be used for outdoor travel towels, camping towels, beach towels and sports towels. What do you think? Would you use one?